Simplify one-pot meals and the pursuit of your home chef passions with the ayesha curry(tm) home collection 5.5-Quart porcelain enamel nonstick covered straining casserole. The ayesha curry(tm) home collection puts inspiring, high-quality cookware in easy reach for creating flawless traditional favorites, whipping up fun and easy weeknight family dinners or making a signature meal for brunches, date night, or holiday get-togethers. This 5.5-Quart porcelain enamel straining casserole pan features chic design in a size that's perfect for pulling together ayesha's meatball and cabbage soup or a family-sized helping of five ingredient pasta. 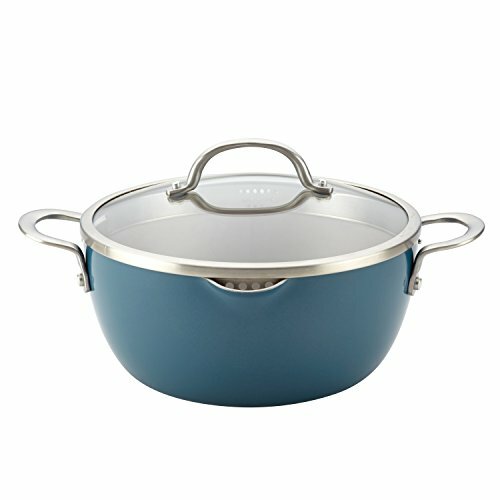 Constructed from fast- and even-heating aluminum with stylish hard porcelain exteriors, the casserole features a sleek, flared Silhouette in gorgeous colors. More than just a pretty pot, this high-quality cookware is heat safe to 500° F and features double-riveted stainless steel handles and shatter resistant glass lid for wielding maximum creativity and versatility in the kitchen. The glass lid features a built-in strainer, and a diamond-textured surface with premium-grade nonstick coating provides long-lasting, effortless food release and easy cleanup of even the grooviest recipes like ayesha's apple-cinnamon oatmeal. Plus, this Ayesha Curry kitchenware helps support no kid hungry to provide up to 500, 000 meals to children in need. Learn more at nokidhungry.Org/one dollar. Life is short, so let your one-pot recipes shine with the ayesha curry(tm) home collection 5.5-Quart porcelain enamel nonstick covered straining casserole.